A fictional tale of one man's journey to find Weapons of Mass Destruction in Iraq. Made for fans of the Shaky-cam technique and people that can't look past the erroneous politics going on here. Right before the war in Iraq started we were all under the impression that they were hiding Weapons of Mass Destruction (WMDs) all over their country. At least this is what we had been told by our leaders and all major news outlets. Now we know differently. We didn’t find a single WMD. Bad intelligence, that’s what it was blamed on. “Green Zone” would have you believe that it was something much more sinister. Was it much more sinister? We can’t really say for sure, but “Green Zone” is adamant in its stance that the entire thing was fabricated, much like the war in “Wag the Dog,” just to get the US to go to war. “Green Zone” seems oddly, ill-timed. It’s not long enough after the main offensive in the Iraqi war that we regard it as an “historical” account, but it’s also been long enough that Americans at large don’t care much anymore. It’s true that our historical thinking about these kinds of things tends to be short-lived, but the fact of the matter is “Green Zone” starring Matt Damon as a WMD hunter in Iraq, ends up just being a heavy-handed, preachy film, which comes at a time when the majority of Americans have accepted what happened and have moved on. 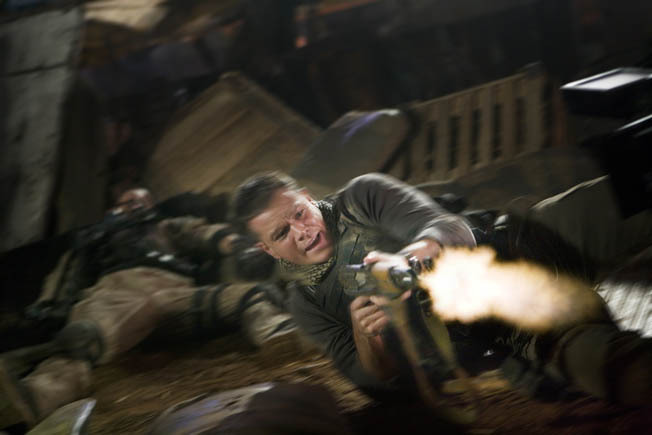 Matt Damon’s character, Chief Miller of the US Army, has been assigned the duty to hit all of the high priority targets that are sure to contain WMDs. But when Miller and his crew get to each site they end up coming up empty again and again. If they didn’t know any better they’d think there were no WMDs in Iraq. Miller takes it upon himself to untangle what turns out to be a very knotted up conspiracy that just may reach to the highest levels of government. You can tell the director Paul Greengrass, who also directed the “Bourne” movies, has a very formulated opinion on why this WMD intelligence was bad. After a while the movie starts to feel more like his personal soapbox than a factual account of what happened. A documentary about what really happened might be much more exciting and worthwhile. Instead “Green Zone” takes the idea that the American people were set up, by their leaders, and runs with it, literally runs. Seems like Miller never stops running. He’s always chasing down someone; enter Greengrass’ patented Shaky-cam technique. In an effort to apparently make just about everything that happens on screen and unintelligible mess, Greengrass flings his camera back and forth without actually framing a shot. This kind of film making is getting nauseating. The novelty has worn off since Greengrass first introduced us to handheld filming in “The Bourne Supremacy.” Shaky-cam’s intended effect is to make you understand how hectic the situation is, when its true effect is throwing off your equilibrium. The final chase scene in the movie is a blurry mess. It’s ugly filmmaking. It’s almost impossible to tell who is who, where they’re running, and who they’re running from. If it weren’t for Greengrass’ Shaky-cam, “Green Zone” would at least be watchable, but with the Shaky-cam this film turns into an unwatchable mess. Not just because of its hammed-up preaching, but because you can’t ever tell what’s happening on screen. I found myself hoping they would indeed find WMDs. Then they could’ve strapped the Shaky-cam to them and set them off.